It was a strange Christmas for me. How about you? I flew into Stansted, in spite of being destined for Leeds Bradford airport. Nine hours later than planned, a neighbour’s very kind son deposited me at my hotel, tired and somewhat bemused at the chain of events. It could only get better, and mostly it did. Christmas Day should be spent with people you love, and it was. Blue skies in Leeds in late December, however briefly, a bonus. Put your gloves on and join me in a sparkly, frosty walk. You know you need the exercise! We’re starting out around Granary Wharf, near to the railway station. Underneath the arches, a neglected image of times gone by. 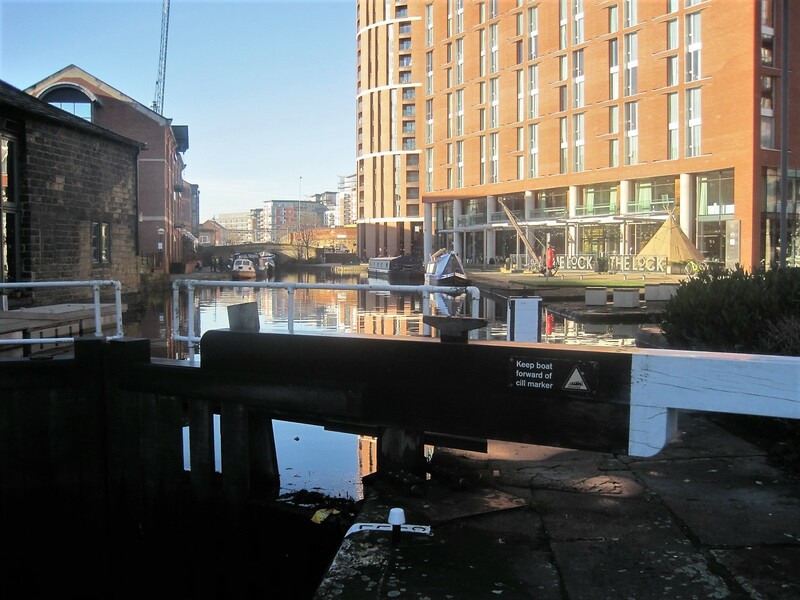 The Leeds and Liverpool Canal is sandwiched between remnants of the industrial past and modern apartment blocks, and on a bright day the towpath makes for a pleasant walk. Don’t forget to check out the view behind you, and keep an eye out for those demon cyclists! 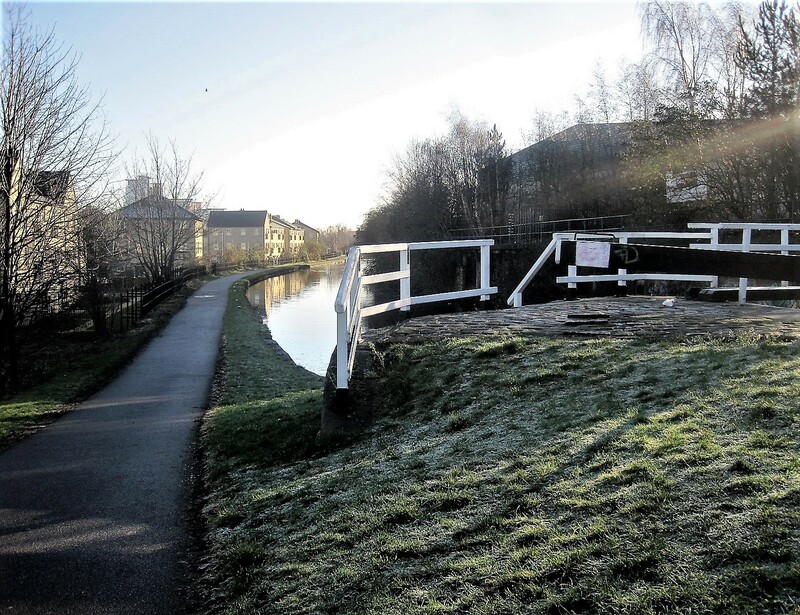 A colossal undertaking, primarily to transport coal for industry in the 18th century, the Leeds and Liverpool Canal runs for 204km in total, with 91 locks. We’re only covering a tiny section today, right in the centre of Leeds. It was Christmas Eve and I was avoiding the bustle of the city streets, whilst still hoping to meet our son for coffee. 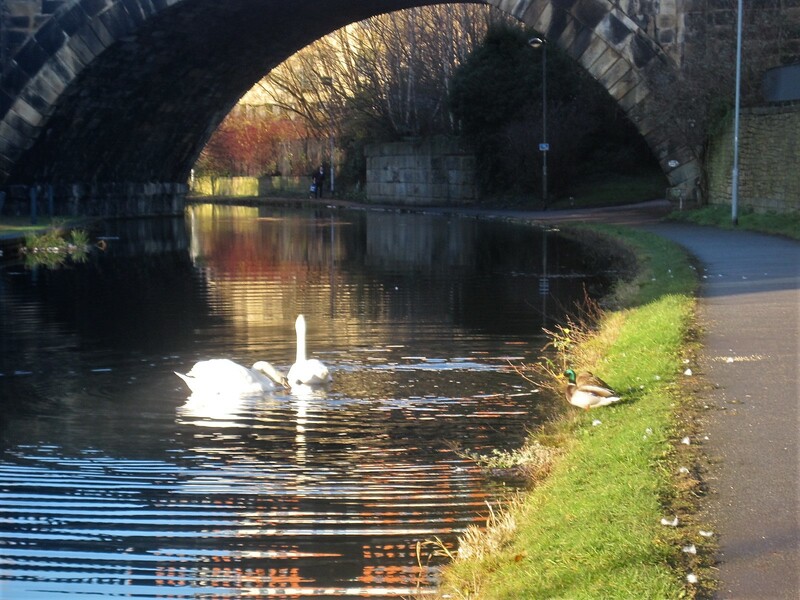 In places the canal runs parallel with the River Aire, offering an alternate route. Ugliness is a close neighbour with beauty here. One moment I’m admiring lily pads and reflections, the next confronted with urban scrawl and litter. All is redeemed when I round a bend and find a pair of swans communing with a family of ducks. The natural world is at peace. I’ve always been fascinated by locks, and find them a welcome distraction from gloomy tunnels and ever-present graffiti. The combination of old mills and rippling reflections works like a charm, soothing with their beauty. Remnants of once meaningful murals cling to tired brick walls. The water races headlong, a solitary swan seeming not to notice his drab surrounds. Where the sun’s soft caress has yet to reach, a hard frost remains. I look back along the canal and know that I must retrace some of my steps. A coffee laced with Bailey’s awaits, but more importantly, my son. The path continues on for many miles and I hope some day to complete the section from here to lovely Kirkstall Abbey, a short distance away. And just in case you thought I wasn’t keeping my eye on the time while I was in Leeds…. Time’s up, it seems! Thanks, Becky. Wishing you and yours lots of good times in 2019! This visit was all about family, and we managed to unite son and daughter, and their partners, in Nottingham, after a tortuous journey by road. Worth it, of course! Now I’m back in the Algarve with my memories. And some more walks to share. Fancy a swift walk with my mate Andrew? Cathy gives us sweeping plains, petroglyphs and a great house, Chaco style! We’ve reached the last day of the year. Goodness knows how! It only remains to wish you all the healthiest of years ahead. Mine will start with a bang, beside the bridge at Tavira. A first for me, but not the last, I hope. Happy New Year!